Valworx 563212C electric actuated 3-way T-port stainless steel ball valve is used to control the flow of water, air, oil, and other media compatible with the materials of construction. These FULL PORT valves are typically used as a diverter valve. Actuator uses power-to-open (position 2) and power-to-close (position 1), stays in last known position with loss of power. On receipt of a continuous voltage signal, the motor runs and via a self-locking gear drive rotates the ball one quarter turn. The motor is automatically stopped by internal cams striking limit switches. On receipt of a reversing continuous signal, the motor turns in the opposite direction reversing the valve position. 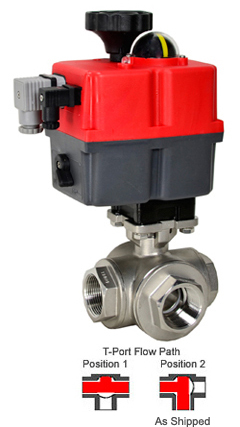 The ball valve is direct mounted to the actuator using the international standard ISO5211 mounting pad. Anti-condensation heater will help protect actuator against damage caused by condensation. Two limit switches are provided to confirm valve position. Manual override can be used to operate valve during setup or with loss of electrical power. Maximum media working temperature is 158 °F (70 °C). Order optional high temperature valve mounting kit to extend media working temperature up to 266 °F (130 °C). Suitable for steam service up to 25 PSI with kit and vacuum service to 29 inch Hg. Advantages of electric actuated ball valves over other type valves may include: higher flow rates, higher pressures, higher temperatures, wider media compatibility, full port flow path, and reduced water hammer.